DreamStone's luxury line of fine jewelry are hand-set with only the finest diamonds. Browse a carefully selected display of pieces that will surely surpass her expectations. This stunning eternity diamond band is set with round brilliant diamonds in a shared-prong gallery edge platinum setting. Approximately 5 carat total diamond weight. The weight and price varies by ring size. 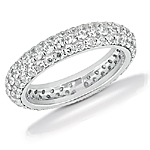 Beautiful and elegant, this platinum band features two rows of brilliance with pave-set diamonds. Approximately 2 1/2 carat total weight. 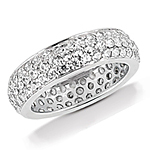 The weight and price varies by ring size.